PC's Blog: Cover for Goddess of Love! I have got to get this book!! I have never laughed so much! Ha! Totally fun to read YOUR version of Venus on Earth! Not all that much different than MY version. Too funny! Can't wait to read it, girl! Looking so forward to it PC. I loved the cover and can't wait to read the book. The excerpt was great! OMG! I love this book already! The cover is gorgeous. One of your biggest fans! I am very excited about this book. The only thing missing is who is the hero? And what is Persephone up to since we saw her last? I have to go home and read Goddess Or Spring again. That is my all time fave...next to Goddess of the Rose. ACK! Why must it take so long for books to come out! Hi Lyricalcatt! 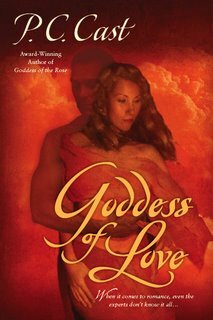 There really are two heros and two heroines in this book: Venus, her mortal friend and "project" who's known as Pea, Vulcan (God of Fire), and a delicious mortal fireman named Griffin. Enjoy, baby!